Here we go again, another kids movie. I didn’t expect to come out of this one having learned. 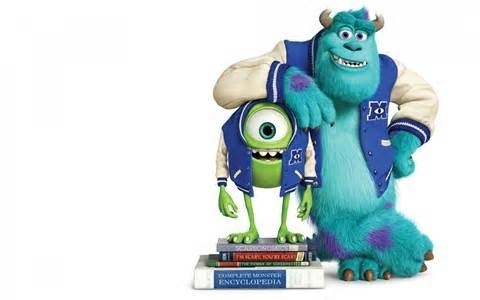 This was not just a monsters university but one for my kids as well. Congratulations to the writers of this animated 3D movie. An adorable, captivating story of two opposite monsters. Both attending Monsters University from two different perspectives. One is dedicated to succeed with a passion beyond our parental dreams but lacking the main component for Monsters University Scare School which requires monsters to actually be scary. This little round and adorable monster is driven to learn all that is taught and follows all the rules. The other monster expects to succeed without putting any effort. Gifted with the ability to scare and confident of his success without any interest in study, breaking all the rules and seeking popularity. This film portrays a captivating university environment. I can’t imagine my children watching this and not wanting to be a part of our academic institutions. The film gives the viewer a nice tour of the ins and outs of campus life. It made me want to go back to school. As the story unfolds these two monsters must unite. The monsters learn that they need to work as a team in order to succeed. This message comes out loud and clear. This film plants such amazing, positive seeds in the minds of our children. It teaches them that they can be who ever they want to be if they work hard, trust in their passion and not allow others to tell them they can not succeed. It teaches them that we are not an island and that we need each other and that each of us has a skill that we can use together to complete each other. There are so many optimistic messages written in this script. Encouraging our kids to follow their passion, get a great education and develop friendships that will last them a lifetime. Priceless!